Chicago Heights, IL–(ENEWSPF)– All things are possible. That’s the message that Jerry Blakemore had for the graduates at Prairie State College’s (PSC) 51st annual commencement ceremony held on May 22. Blakemore, who grew up in Ford Heights, is the vice president and general counsel for Southern Illinois University. More than 450 students graduated from PSC and earned associate degrees and certificates. A record number 300 students participated in the ceremony. Also during the ceremony, Etta Oben, of Matteson; Allison Trujillo, of Chicago Heights; and Cayla Wiegele, of Beecher, received the President’s Leadership Award. This annual award is given to one or more graduates who have maintained a high academic standing while demonstrating significant leadership contributions to the college. Alyssa Rhodes, of Homewood; and Lauren-Ashley White, of Chicago Heights; received recognition as members of the Phi Theta Kappa All-Illinois Academic Team. 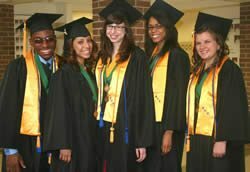 Phi Theta Kappa is the international honor society for community college students.